Do you remember that time I was asked to lead a food writing workshop for high school students? I was asked to do it again in 2014. This time, it was a lively bunch of future professional writers who were incredibly excited, hungry for knowledge (and food) and drooled over all of the literary nuggets given to them throughout the week. I even had a repeat offender from last year. Last year, I carefully crafted a plan with worksheets and a little talk about what food writing is and how to get into it. This year, the only thing I Crafted was our trip to the hottest restaurant in Greensboro: Crafted, The Art of the Taco. Chef and friend, Kristina Fuller and her mom, Rhonda run the joint and allowed us to come and sample a spread of tacos, sides and trendy Greensboro sensibilities for an hour or so. I talked about how writing about food isn't just documenting what you ate and how it tasted; The key to good food writing is the story you tell and connecting with your audience in a way that they'll be able to understand since they were not at the same meal as you. Below is the result of my laid-back approach to food writing. I think it worked out well. You be the judge. Be kind and comment below to let the students know how you connected to their writing. Thank you! A special shout out goes to my friend and former co-worker, Tina Firesheets, who asked me to do this and is amazing, wonderful and one of my best foodie friends. She is always down for a new culinary adventure. I can't wait to see what she cooks up next. Literally. The building was neatly decorated and had a good vibe. They had a good selection of food and lots of variety. The fries had a good saltiness, but they were a bit sweet. The chips, when plain, didn’t have much flavor and were dull. The tacos had a tangy taste. I thought they had a bit too much spice, though when I added sauce, I liked them better. A long corridor awaited me. Tacos? I looked to the left. I could almost smell it. Almost, because I had somehow managed to get a cold and my nose was stuffy. All the people who had talked about this place so far had raved. “You have to try their kimchi tacos. I think it was called the Fedora? I had high hopes. Not just because I wanted to eat some good food, but because my bottomless abyss of a stomach was rumbling so loud, that I was sure everyone could hear it. But no one seemed to notice. Then the food came out. The tacos. Let me tell you, the aftertaste is a bit peculiar. You see, The first “taste” that fills your mouth is that of a regular soft taco: beans, salsa, onions, etc. etc. But then (yup there’s more) the after taste kicks in. There was something irregular. It was cilantro. Now, the aversion to cilantro is not strong within me, but I know for some that it is. Even though it tasted decent, I would have preferred something zesty or, even, something more savory. As for me, cilantro is best paired with Asian food, such as pho (in my biased opinion). Still, I was a satisfied diner. Happily munching on my taco and fries (which are absolutely perfectly fried), someone nudged me. I picked up the lime and placed it inside my taco. They chuckled. With my face hot and embarrassed, I pinched the lime. The sour aroma of the citrus wafted to my nose. Instantly I regretted placing lime juice on my taco. But what was done was done. I opened my mouth, and chomped. Tangy. A bit bitter, mixing with the rich beans, and the salsa. The lime’s extract added a slightly pleasant taste - the bland flavor of the avocado and the sour tint of lime mixed together. Ah. I understood. It tasted horrible. The lime did. Not the taco. 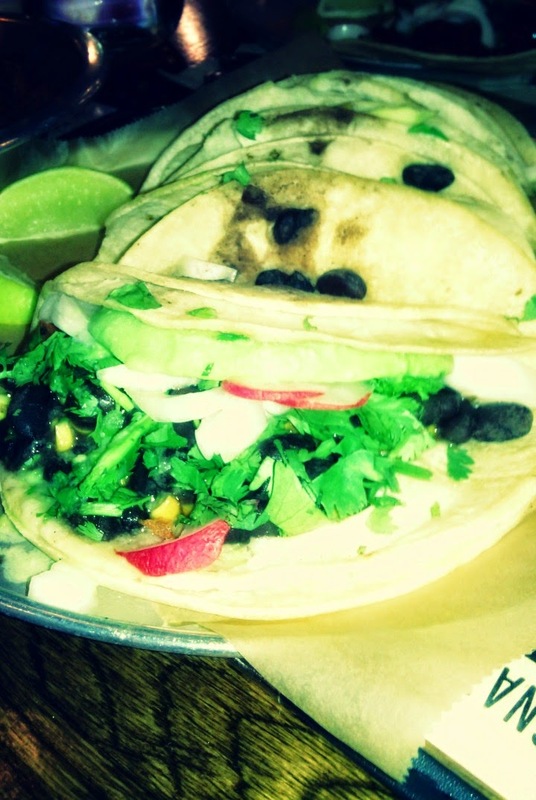 Crafted - the Art of the Taco is a wonderful place to eat. I remember my visit perfectly. I sat in the booth side of the table, in front of many paintings. The waiters delivered a jar full of water and little cups of red and yellow sauces. They also brought four little plates to the each end of our table. 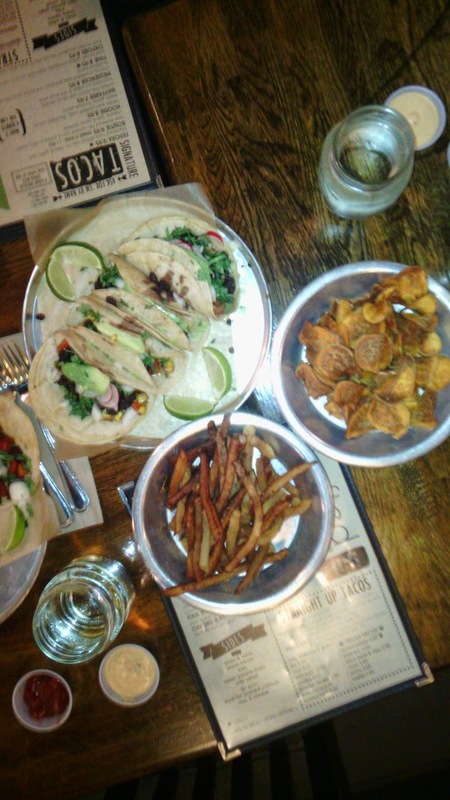 A few minutes afterward, they brought sweet potato chips, fries, potato tacos and black bean tacos. I sampled the fries and a potato taco. The fries - which I ate most of - had a salty, tangy taste. They were quite a bit crunchy, which made them all the more satisfying. The potato taco was wonderful. It was slightly spicy, and with lime, it was a bit sour - in a good way. The ingredients were freshly made. Corn tortillas, diced potato, an avocado slice, onion, cilantro, radishes and lime. I honestly really hate avocados to the end of the world, but after this experience, I might give them a second chance. I loved my experience, and I hope I can go again. As soon as I walked into Crafted I was captured by the luxurious smells of sizzling food and buzzing conversations. Then I walked down a slender walk way to the tables, and waited to be served. I selected a potato taco. It had wonderful shaved radishes and a ripe avocado slice [To be truthful, I hate avocados with a burning heart. But the avocado went so well with it. It was perfectly flavorful and ripe]. Now let's get to the part that the taco is really about THE POTATOES. They were grilled, with red bell peppers and cilantro. My first bite was full of fresh flavors. It was like a community get together of food - in my mouth. Everything about the place was artistic and rustic. I loved the lighting, which set a mood that made it feel spacious and comfortable. The art in the dining room also made it upbeat, combined with the conversations - everything was very alive.